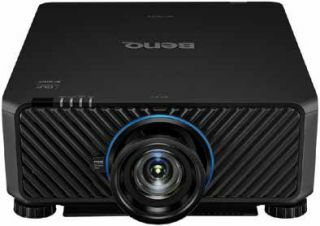 The BenQ LU9715 BlueCore Laser Projector is a bright choice for larger classrooms and auditoriums. It delivers 8000 ANSI-lumen brightness and 100,000:1 contrast ratio for superior viewing even under bright ambient lighting. The BlueCore laser engine provides significantly improved color performance through a dual color wheel system, supports 360° and portrait installation, and offers a selection of lenses for a wide range of projector placement options. The LU9715 features proprietary BlueCore 1-chip DLP high brightness laser technology and WUXGA native resolution (1920 x 1200) for stunning image quality courtesy of dual color wheel projection. Combined with great installation flexibility and a maintenance-free laser light source, the BlueCore laser projector reduces total cost of ownership for schools with 20,000 hours of maintenance-free operation, saving on lamp replacement and maintenance costs. The Boxlight P9 pen-interactive projector brings short throw projected images and collaborative areas to classrooms. Up to five students can work together at the front of the room. The full-featured projector comes complete with the award-winning MimioStudio classroom software and three free MimioMobile device connections, allowing teachers to perform collaboration and assessment activities at the front of the room with almost any student device. Additionally, the projectors’ analog and digital audio/video connections ensure compatibility with virtually any PC. The P9 pen-interactive projectors include the dynamic MimioStudio classroom software. It connects the Boxlight products, so using other tools—from the document camera to the pen tablet—is quick and easy. MimioStudio software allows educators to create interactive lessons and collaborative activities, and perform real-time assessment. The software also opens other IWB activities, enabling educators to use the interactive content they already have. Canon released two new DLP projectors, the LVHD420 full HD DLP projector and LV-X420 DLP projector. Balancing image quality and versatility, the compact LV-HD420 and LV-X420 projectors offer native full HD (1920 x 1080) and XGA (1024 x 768) resolutions, respectively, as well as 4200 lumens and a high contrast ratio (8,000:1 for the LV-HD420 and 10,000:1 for the LV-X420), all in an approximate 7 lb. compact body. Both models include the BrilliantColor system and a range of image quality adjustments, have the capability to display 3D content via a DLP-Link system, and include a built-in high-powered 10W speaker. For simplified installation and maintenance, both models include dual HDMI inputs with MHL support and are filter-free. Casio’s Ultra Short Throw Projector can project brilliant, shadow-free, crisp images at close range with its built-in 0.28:1 fixed lens. Its laser & LED hybrid light engine lasts for up to 20,000 hours without needing to replace costly lamps or filters, and requires minimal maintenance. The XJUT351WN produces 3500 lumens of brightness and boasts WXGA (1280 x 800) resolution with a 20,000:1 contrast ratio, which is ideal for displaying HD content from video and computer sources. Two (2) HDMI inputs provide connectivity with all current display technology without the need for switching cables. A high-power USB port (5v DC, 2A) provides direct power for USB stick devices and eliminates the need for a separate power supply. Network (RJ-45) and local RS-232 connections provide control and remote status monitoring capabilities and adding the optional YW-40 wireless adapter allows for wireless display streaming for a Windows and Apple computer, or download the Casio C-Assist App for wireless display of content from a tablet (IOS and Android). The Christie AP Series comprises two 5,000-lumen-class 3LCD projectors in a compact, user-friendly, and value-added package. Offering a long lamp life (up to 6,000 hours) and integrated audio, the AP Series provides a low total cost of ownership and is designed for easy classroom installation and use. Featuring a comprehensive list of I/O connections, including HDBaseT, the Christie AP Series handles a variety of integration environments and content sources. With WXGA or WUXGA resolution and up to 10,000:1 contrast ratio, images are crisp and clear, ensuring content looks great in any classroom. Special pricing for schools is available through the Christie ScholarTech program. Epson announced the latest BrightLink Interactive ultra short throw presentation displays for education, including the BrightLink 685Wi, 695Wi, 696Ui, and 697Ui. These enhanced displays enable individualized instruction with wireless content sharing and deliver crisp image quality, with up to full HD resolution and a bright, readable, interactive image up to 100 inches—3x as big as a 60-inch flat panel. Combined with Epson’s advanced 3LCD light engine for bright, vivid colors, the new BrightLink interactive displays result in impactful presentations and productive collaboration. The new BrightLink interactive presentation displays deliver wireless capabilities for easy content sharing to help students learn and collaborate. The BrightLink series now enables instructors to share content between the big screen and wirelessly connected mobile devices for individualized learning. With the Epson Multi-PC Projection with Moderator function and the Epson iProjection App, teachers have the ability to see and choose to display up to four devices simultaneously from a maximum of 50 connected student devices for an engaging, collaborative classroom experience. The new BrightLink series also introduces DuoLink, an extended whiteboard feature enabling teachers and students to get twice the collaboration space by utilizing two BrightLink devices side by side. Hitachi America introduced the LP-WU3500, 3,500 lumen LED projector. In addition to brightness and clarity, the LPWU3500 offers low total cost and low-maintenance ownership, with an expected 20,000 hours of life. The new LP-WU3500 projector comes with a host of features and an exceptional five-year or 20,000 hours limited warranty, for a long life of worry-free operation. The LP-WU3500 operates at a much lower noise level than other projectors, making it ideal for presentations and classroom environments. The dust-resistant structure applied to the optical engine reduces the effect of dust and particles in the air and enables the projector to be used in an array of environments without overheating and creating unnecessary noise. Without the costs for replacement lamps, the LP-WU3500 projector is a great total cost of ownership investment. The IN2120a projector from InFocus is ideal for classroom environments for easy video and digital content display. The projector can display content from HDMI, USB, or 2 GB of internal memory, as well as 3D content from Blu-ray or PC. Educators can use this affordable projector to enhance the interactivity of their classroom by allowing their students to share their documents, videos, audio, and photos, which can be cast wirelessly from a mobile or personal device. This projector features a wide variety of connection capabilities including HDMI, VGA, USB, wireless connectivity, PC, and Blu-ray to allow teachers and students to share content to enhance their learning and collaboration. Boasting impressive brightness of 3,500 lumens, the IN2120a network projector increases effectiveness and visibility of presentations and lessons, and with minimal IT configuration needed, the IN2120a projector can connect to internal networks and sync with Crestron or AMX systems. NEC Display Solutions of America announced four LCD installation projectors that deliver UHD Blu-ray and 4K content support, extended lamp and filter life, and a wider color space, enhancing the user experience and lowering the total cost of ownership for users needing large images or higher brightness on the screen. Ranging from 6,500 lumens to 9,000 lumens, the latest innovations in the PA Series include the NP-PA653U, NP-PA803U, NP-PA853W, and NP-PA903X projectors with WUXGA, WUXGA, WXGA, and XGA resolutions, respectively. A key differentiator in these latest compact models is NEC’s Scaler Chip, an advancement in picture processing. The integrated picture processor simultaneously manages a 4K/60p input and shares signal output with multiple daisy-chained connected projectors. It also translates into unsurpassed image noise reduction, de-interlacing, scaling, and full 10-bit color processing, giving education, museum, corporate, retail, and other industry users a better overall viewing experience. The Optoma ZH400UST is a good choice for classroom settings, combining the best of what projection offers today—a high-definition, bright, and colorful image, an ultra short throw ratio, and a laser light source to provide the ultimate in reliability with 20,000+ hours of virtually maintenance-free lifetime performance. Featuring 4,000 lumens and a contrast ratio of 100,000:1 with Dynamic Black enabled, the ZH400UST is equipped with a 10-watt speaker, and a PC-free USB media player to support video, audio, image, and presentation files from any USB device. The Optoma ZH400UST combines reliability and maintenance-free operation with flexibility. With a throw ratio of just .25, the Optoma ZH400UST can display a 100’’ image from only 13’’ away, making it the ideal projector for space-constrained environments. It is also equipped with state-of-the-art laser phosphor display technology for the absolute best in picture quality and color performance, outperforming traditional lamp-based projectors with rich color and deep black levels. The portable RICOH PJ WX4152NI is an ultra short throw, 360-degree projector capable of showcasing interactive images on walls, floors, and tabletops when placed mere inches from the projection surface, enabling more collaborative experiences for students. A high-precision wireless digital pen lets participants directly annotate and highlight the projected surface. LAN and wireless connections empower participants to share documents and images directly from their devices to drive even more collaboration, from algebra problems to essay feedback. The RICOH PJ WX4152NI boasts a number of features to make projecting information where and when you need it as simple, effective, and collaborative as possible. In addition to its industry-leading short throw distance, the projector is small enough to be comfortably portable. Content can be projected directly from a USB drive or memory card, or accessed via LAN or wireless network, so wherever a teacher goes, their high-quality, interactive projection capabilities follow. The ViewSonic PJD6352LS is a short throw, XGA, networkable projector, featuring 3200 lumens of brightness in a sleek form factor. Built-in SuperColor technology offers vivid image reproduction; the proprietary SonicExpert sound enhancement technology delivers incredibly clear sound. PortAll, an enclosed HDMI/MHL connection compartment, supports streaming media from wireless HDMI dongles or MHL connectors. With an adapter plate, an existing SMART Board or Promethean Interactive White Boards can be upgraded with the latest projection technology. The PJD6352LS includes a cable management hood that eliminates cable clutter, and the top lamp door enables easy access for lamp maintenance. The long-lasting bulb offers up to 10,000 hours in Dynamic Eco Mode. A 0.61 short throw lens ensures large screen projection for smaller spaces, and corner adjustment and HV keystone provide set-up flexibility. Crestron RoomView Express provides network management to remotely control 250+ LightStream projectors from a single PC. Lightweight and packed with features, this is an ideal projector for classrooms. The DH765Z-UST from Vivitek is a full high-definition, ultra short throw laser projector with an advanced phosphorus light engine and lampless design. With a large 100” projection only 20 inches from the projection surface, the projected image is shadow-free, allowing students in any area of the classroom to see the day’s lesson. With 3500 ANSI lumens, the DH765Z-UST allows instructors to engage students and create a truly visual learning experience. The DH765Z-UST offers the next generation of advanced projection technology, giving an immersive big-screen experience in short viewing distances. It delivers vivid colors and a brightness of 3,500 ANSI lumens. Built lamp-free, the DH765Z-UST provides a low cost of ownership, with minimal maintenance, and emits a high-quality projection for up to 20,000 hours. The HD765Z-UST features HDMI, component, composite video, s-video, and VGA-in/out connectivity options with an embedded 10W audio speaker and multiple audio in/out ports.